Here are my first 2 miniature flowers: the Ohia Lehua (Pele's flower) to the left and the Protea to the right. I wish they'd be a bit more realistic, but working on such a small scale is hard to keep the details. The Protea looks a bit like a water lily, but if I'd kept the petals shorter and narrower, I would have lost the possibility to use all the colors I needed for the shading. 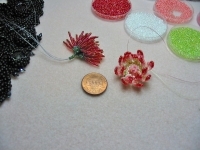 Both flowers are beaded with size 15/0 Japanese seed beads. The center of the Proteaa is a 12mm Rivoli.